at our February fundraising party! We’ll be posting the stunning results shortly, so stay tuned! Show YOUR love for our library by joining the Friends! We are local volunteers who support the programs and services of Woodland Community Library. As part of the Fort Vancouver Regional Libraries (FVRL), we operate under the umbrella of the FVRL Foundation, a 501 (c)(3) nonprofit. A modern, fully functional library is essential to a healthy community. 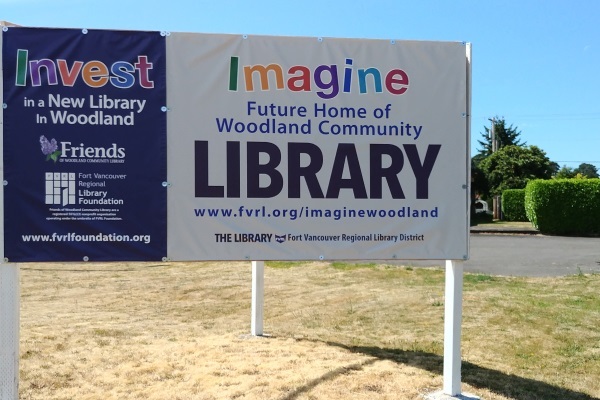 Woodland’s growth means our current library cannot meet our needs. This is why our vision is clear and critical. A New Library for Woodland! Pride in great library services and soon, a new library! Bonus: You can be as active as your desire and situation allow. On the membership form, please note what types of activities interest you and what your availability is. If you can’t volunteer at this time, your membership alone contributes to the funds for current library programs and our new library. We’ll let you know when volunteer opportunities arise and welcome your participation whenever it works for you! the sooner we’ll have a Bigger, Better Library! So Don’t Wait! Join Us Now! No classes are scheduled at the moment, but we do have other events coming up. Please see our BOOK SALES/EVENTS page!